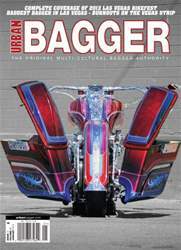 2013 Las Vegas Bike Fest, Baddest Bagger in Vegas and the Baddest Bagger Burnouts on the Strip are the events covered in this issue. Buyer's Guides include the coolest windshields and fairings on the market. Tech Stories featured are Kuryakyn Street Sleeper II Accutronix/Roaring Toys Night Series floorboard controls, Feuling FLH Oil Cooler and a Kendall Johnson 89" Stroker kit for Evo's. The cover bike is the Baddest Bagger in Las Vegas Gull Wing Style bagger.